On one of our recent trips to Manhattan, we ended up wandering up Broadway around Madison Square Park, and that’s where we found that UrbanSpace runs a seasonal pop-up market called Broadway Bites, featuring a rather interesting mix of food stalls lined up along Greeley Square Park, located at the intersection of 33rd Street and Broadway. There were quite a few interesting vendors there: the Poffertjes Man (Dutch pancakes), a Cannoli vendor, a grilled cheese stand, and the like. 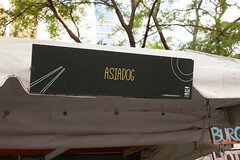 But one in particular attracted my attention, and my mid-afternoon snack hunger: AsiaDog. 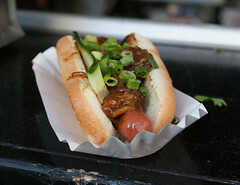 AsiaDog has a very simple concept: their menu is basically hot dogs, corn dogs, and burgers, but served up with a twist: the topping are all Asian-inspired, focusing on those cuisines with good representation in NYC: Chinese, Korean, Vietnamese, and Japanese… as well as a few others. The gamut of toppings runs from the relatively straightforward: the Ginny with kimchi and nori flakes, to the elaborate Vinh (basically a fusion of a bánh mì with a hot dog instead of pork), to the unusual Mash (spicy ketchup, jalapeno mustard, and crushed potato chips). But I was drawn to the Chinese item: the Wang Ding with Chinese Pork Belly, Scallion, and cucumbers. But before I get too far into the toppings, I’ll start with the fact that this was actually a rather good hot dog lying underneath it all. I had opted for the organic beef hot dog, and wherever AsiaDog is sourcing their dogs, this was a rather nice beef dog: a rich meaty beef, coarse in grind, with more than a little mace flavoring, without a huge amount of sodium that usually is the hallmark of a beef dog. A decent snappy casing, cooked up so the casing is just starting to rip open, and this was how I like a good grilled dog: juicy and just a little bit crispy. The pork belly was a very nice, tender, Chinese-BBQ style pork belly, and it combined nicely with the very crisp and freshly-sliced cucumber and scallions. A lot of times, fusion hot dogs fall flat, but this was a solid winner. 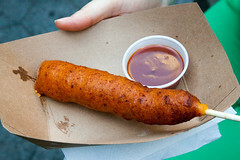 Carol did quite well with her choice as well: the kimchi pancake corn dog. This was a very inventive little item, basically your standard corn dog, fried up fresh, but using kimchi pancake batter instead of the usual corndog batter. Served up with a spicy chili ketchup, this was a very nicely crisped dog with the perfect combination of flavors. We were very pleased with AsiaDog, and I’ll have to say, they’ll stay on my list of snack places in NYC (which is getting quite long…). But for those of you looking for AsiaDog, you don’t need to wait for the Broadway Bites market on Saturdays… they’ve also got a brick and mortar shop at 66 Kenmare Street in Nolita. I may have to make that a stop next time I’m in the area.